This is the foundation of the Law of Attraction. Quantum Physics says everything is energy. What will flow into your life is a copy of the feelings and beliefs you send out. 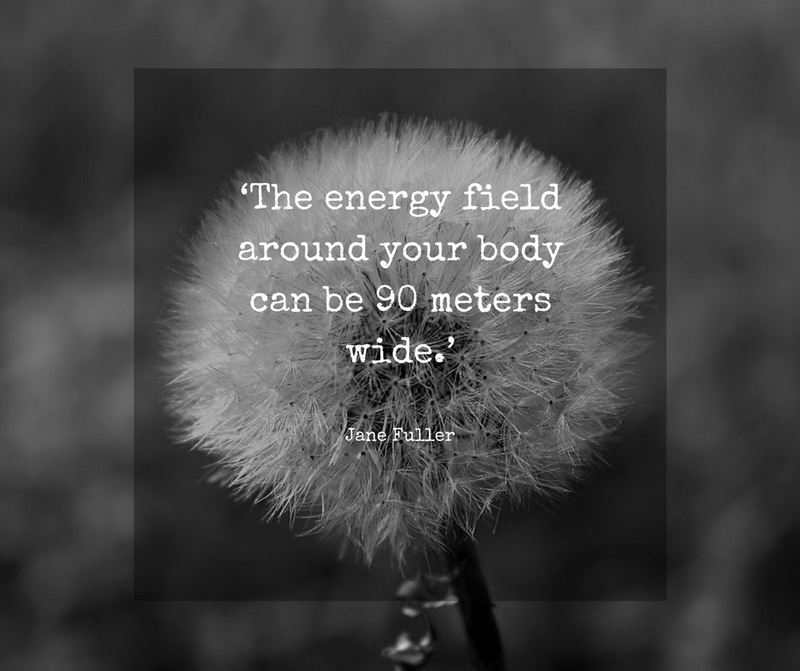 Cells behave with information they get from energy around your body. Atoms share information. If you’re going through a divine storm right now – see it as a gift. We’ve all had a divine storm in our lives. Moments when you feel that life/The Universe is against us. I call it a wake-up call. The past full moon and partial eclipse in Aquarius last Thursday (August 18th) has had a powerful effect and has really made me feel totally connected to my deeper soul with a true understanding that there are no limits. According to many respected astrologers, I gather we are presently in the midst of a karmic mission on both a collective and personal level. To access creativity, rest more. Relax into better thoughts and allow your grid to fill-in. The flawed premise of our current world is that the more you do, the more you are worth. Busyness is the most flawed premise of all. I worked for 30 years under this flawed premise – and realised the futility of just striving to earn more money - I thought the busier I was the happier I’d be! With everyone else competing to be busier! How silly is that now?! It triggered a deeper quest for more meaning in my life. I am a storyteller. We are all storytellers. We are the directors, producers and stars of our own movie called ‘Life’. I believe we are all stars. When I started writing my first blog I called it ‘Life is an Epic Production’ because I wanted to get the message across that we really are the director, producer, writer and chief protagonist of our own lives - and if we treat life as an epic production that we get to write, produce and direct, what fun we can have! By being aware of what we attract with our thoughts and words we really can shine! By becoming our own first fan, believing in ourselves and by understanding and accepting and embracing who we are we can love and nurture our inner screenwriter! Your mind is yours to direct too because your mind controls the results. Demand that your mind helps you. As you choose your family so you choose your life - with visualisations and affirmations - exactly how actors work on becoming the role they play. Believe that what you want has already happened because you attract through your beliefs. If you’re not happy, change your beliefs in your subconscious because your subconscious is the one in control of the programmes in your mind. Remember to be grateful for any negative moments too - see them as a positive for learning because we learn far more from our failures than our successes but also remember that there is no limit to what you can have. Don’t let the programmes in your subconscious sabotage you! Remember, we see the world not as it is but as we are, so re-write your inner dialogue to stardom. As we live, we learn who we are and with self-knowledge comes self belief! Let your very identity be your hook. If you can dream it you can do it - that’s the magic of the movies too! And remember to edit out the unhappy replays that you have in your mind that can just be faulty subconscious thinking - make way for a new way of thinking. Choose to create long-term health and happiness for yourself because it really is a choice. Make a statement of intent to be who you want to be - announce it daily to the universe. By working on your mental and physical fitness you will improve your attitude and energy levels and point of attraction too! And meditation/mindfulness can help give a lasting change to your beliefs. Make people feel better and lighter - because you have unique gifts and talents to share and remember you have to be your own first fan! You get to be the star of your life - and success and gratitude go hand in hand which every BAFTA/Oscar winner understands……..you are the star of your own movie so don’t cast yourself as an extra! Let the way people say your name sound like the sweetest melody but live for your soul not your ego because we have everything we need within us! BAFTA voting is underway and it got me thinking about what fun the movies play in our lives. This is one of the reasons I loved producing. You act as if. I think that is why most people love Christmas - in that it’s fun and glamorous like a great movie. May you have the most fun and glamorous Christmas and may your dreams come true in 2016! And remember, when you wish upon a star we are also made up of the same material as the stars - energy and light! Have a very Happy Christmas and a brilliant New Year! I find reading books brings me great joy - there is nothing better than a good book with inspiring words. A great book will inspire your imagination with the power of its words. However, I often find an inspirational quote on Facebook can do the same. I also believe that the words you speak to yourself and others carry tremendous energy because the words you are habitually using are creating your reality. I so believe that if we can respect the power our words carry we can collaborate with that universal energy and create what we want. The universe will provide what you want by listening to the words you speak. If you change the words you speak to reflect words that represent what you want in life you will create your own abundance. If you want it, say it. Never say can't. You always can. It is really that simple. Your subconscious mind and the Universe will hear you and rise up to have a fantastic collaboration! I've mentioned many times in previous blogs about gratitude and thoughts which help plant the seeds but our words are equally as important and they carry tremendous energy. So speak of what you want by using positive words and phrases and ask the universe to help you. You can change your world by changing your words. Positive abundant words and repeating them often will open up the channels to create a life you want. The Law of Abundance will work in alignment with what you want to create. Your words and thoughts create your life. So make sure the Universe understands what you want by speaking of it! The universe will take care of you and provide for you. All the universe wants is your acknowledgement and connection to it's source. As Arianna often says, "Once we learn to trust it changes everything....". It's that simple. Our parents should be given a manual when we are born so they could teach us this life changing understanding. I also believe this should be taught in schools because changing your words will change your world and that's so empowering.